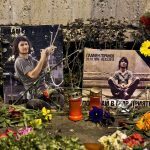 In August 2016, in Bulgaria’s second largest city, Plovdiv, a well-known cultural monument – the old tobacco warehouse – was deliberately set ablaze. The offense, which was subsequently attributed to a local homeless person, naturally took on the public debate in the country. It revealed the extremes to which the appetites of private investors may lead when pursuing an attractive estate, regardless of its historical or architectural significance. Nearly at the same time, in the port city of Varna, the third largest city in Bulgaria, another architectural monument of the period of the tobacco warehouse was virtually made away with – but in a far more discreet and skillful manner. It was Varna’s famous Sea Baths. The concessionaire announced the planned construction works as ‘restoration’ of the original appearance of the Sea Baths and advertised it on billboards across the whole sea promenade. Publicity was also broadcast in all local media, including the Regional production centre of the Bulgarian National Television [BNT] channel. This widely proclaimed ‘restoration’ actually represented the final stage of a process – dating back from 1998 – of turning the Baths from a public space for recreation and healing into a private one full of expensive bars and restaurants. It also completely spoiled the building’s architectural merits. ‘It is a commonly shared opinion that change is good for everyone’, local ‘Cherno more’ [‘Black Sea’] newspaper stated (a paper owned by a circle of companies close to the concessionaire) and boldly denounced any controversy around the topic. But how did all this happen? 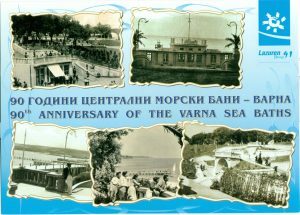 Inaugurated in 1926, the Baths are situated just along the sea shore in the central part of Varna and are supplied by mineral water sources in their immediate proximity. The initial project proposed a swimming pool and 66 tubs with heated sea water pumped from the sea by a motor pump. Mineral water showers and mud therapy facilities were also available, as well as changing rooms and lockers for the sunbathers’ safe storage of personal items. Of course, only the thin urban stratum at that time had the actual possibility of resting in the resort. Despite this, the baths were still municipal property with the explicit designation to serve for healing purposes, among all else. The baths were also an example of the intention of the leadership at that time to develop Varna as the first sea resort – a status, which the city received in 1921. This decision granted Varna’s Municipality the power to collect tourist taxes and to borrow loans for the further development of the resort. The newly built baths did lead to a significant increase of tourist numbers and their premises turned into one of the bigger sources of income for the municipality. Things remained largely unchanged during the socialist period that lasted from the end of WWII until 1989. The baths were used for their designated purpose and the building space was even extended. No doubt, they were no longer a primary tourist attraction, as the newly built facilities in the city and resorts nearby outplaced their significance. Nevertheless, they kept their deserved mention in the tourist guides and still appeared on Varna’s postcards. Socialist rule brought mass scale tourism among other things and thousands of sunbathers visited the Sea Baths on a yearly basis. In 1989 the Bulgarian Communist party lost power and the country entered a transition period towards market economy. In the first few years since 1989, the Baths were neglected and ceased to perform some of their functions. 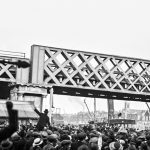 However, they were still operating – the fee to use them was symbolic, the beach area was large and clean, and bars or restaurants built on it could be counted on the fingers of one hand. Until 1998 the state company ‘Lazur’ was the official owner of thе building. This company had been responsible for maintaining all beaches in the country during socialism. In the same year, an important decision changed the Baths function into a designation for night clubs, bars, cafes and other drinking establishments. The rationale for this decision was that their ‘function as changing rooms was now obsolete’. This statement conveniently ignored the fact that the Baths’ sole function was not to house changing rooms. Gradually, the building’s interior suffered increasing dilapidation. Only its facade remained fairly intact. The bars took up the interior and then extended outside, eating up a sizable portion of the beach. Yet, in the southern segment, the mud treatment facility was preserved for almost two decades until 2015. The new function of the Baths started a process of perpetual legal battle over the building’s ownership. The state company ‘Lazur’ was gradually privatized, piece by piece – some private companies took over its functions in Varna and some in other sea areas. In 2006 the government granted concessions for six beaches along the coast, without public auction or private competition, the rational being that there had already been companies running those beaches by the time the privatisation procedure started. A backdated contract gave ‘Lazuren Bryag 91’ company Varna’s central beach, as well as the beach in the ‘Asparuhovo’ neighborhood for a period of 14 years. Other companies took beaches in the places of Primorsko, Kiten, Sunny Beach and St Vlas. Four years later, all of a sudden it turned out that the Baths were no longer considered to be a cultural monument, at least according to ‘Lazuren Bryag 91’ commercial executive, Mr Andrey Vasilev’s confident statement. He said regarding the topic of ‘restoration’: ‘Reconstruction has been fully coordinated with the Ministry of Culture, because, even though the building in-between the beach area and the city is not officially an architectural monument, it is of a century-old value and an immutable element of the historical and aesthetic appearance of Varna.’  There has been no official confirmation by the Ministry of Culture, of any position stated about the restoration works. If they have stated a position, it would have been interesting to know on what basis did they grant permission for the building to be riddled with new PVC windows, new elements from wrought iron, along with new ornamentation from styrofoam, plastered over part of the original ornamentation. The Baths’ facade before and after the most recent repair works. One can easily see the the addition of new decorative elements and the disappearance of others. Until 2012, the Ministry of Culture itself had been listed as an owner of the whole ‘historic core’ of the Sea Garden (a term describing some of the area of the Sea Garden), including the Baths. Then, the government led by the centre-right political party GERB issued a decision to permit the state-owned ‘historic core’ to be gratuitously managed by the municipality on the grounds that there was ‘no further need for it to be managed by the state’. It was stipulated, nonetheless, that this should happen in compliance with the provisions of the Cultural Heritage Law and the protection measures assigned by the Minister of Culture. 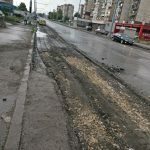 On September 2nd 2016, Varna’s civic ‘Association for Optimization of Justice and Administration’ (SOPA) contested the legality of this transfer and stated that the building was not legally a territory of the municipal government. The Association sent a public request asking whether the Ministry of Culture was still the official managing body of the Baths. The Ministry of Culture’s reply was pending as of October 2016, but it would hardly reverse the drastic changes that were made to the building’s function. This current renovation left no room free of luxurious bars or restaurants. The case of the caLnibani lounge bar which took entirely the space of Varna’s sole mud therapy facility is indicative of this process. 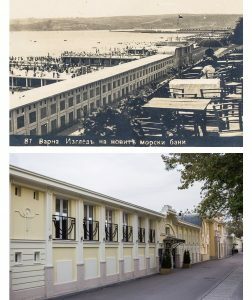 After the hospital was sold it was rapidly renovated and Mr Andrey Vasilev promised the same year that the Baths would open again soon: ‘In addition to the mud therapy and spa treatment, the complex will also have a cafe and a relaxation lounge on the sand, with a mineral water pool.’  As a result, the lounge bar ‘caLnibani’ appeared, but there was no sign of mud therapy and spa treatment. There is a small mineral water pool but it is inside the lounge bar and its fee is far above the paying ability of the average citizen of the EU state with the lowest wages. 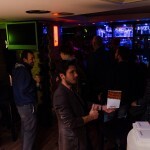 Nobody is disgruntled, though – the venue is private, clients are not missing. Instead of a state hospital facility, there is a bar. 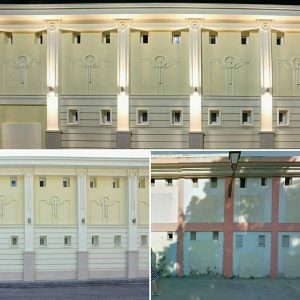 The Sea Baths (excluding the mud therapy facility) are not part of ‘Holding Varna’’s properties, but as we could see already, the concessionaires have been using them as they wish, unobstructed by the city’s authorities. It is important to note that the privatisation of the Baths and the occupancy of restaurants and night clubs at first began without TIM’s participation. The business group subsequently became a major player amidst the favorable situation of mass privatization which encompassed the whole country in the 1990s. TIM played key role in the gradual gentrification of the promenade, seen in the substitution of gypsy orchestras, street singers and seedy taverns with expensive, lustrous venues such as the aforementioned ‘caLnibani’. 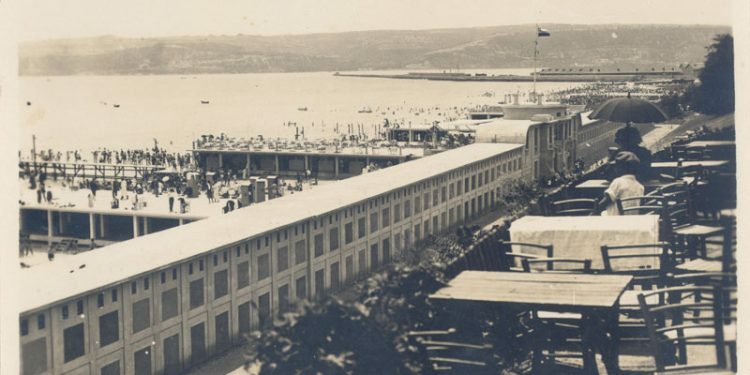 But even before the ‘Alley First’ project, Varna’s seaside had already been privatized to a large extent and the social functions of facilities such as the Baths had been stamped out. This makes all the media noise around the ‘Alley First’ project something of a paradox, since it didn’t focus on the process of transforming public property into private one, but rather on the legal implementation of the transaction itself. In 2011, ‘Capital’ newspaper, for instance – an influential pro-European and liberal Bulgarian, weekly paper – stated that ‘’Holding Varna’’s project named ‘Alley First’ was inspirational and everyone could have benefited from it, if the whole deal had not happened in such a non-transparent way, raising suspicions of corruption’. Another publication in the same paper argues against the call of a local ecological organisation for the promenade to remain public property, stating that ‘as far as we, ‘Capital’ newspaper’s editorial team, believe in the rationality of private enterprise, we deem the third question raised by the civic organisations to be more important – do the investors have equal access and is the price of land paid by the state, just’. 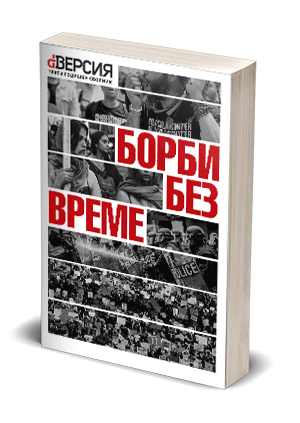 In other words, once again we are faced with the ongoing mantra of liberals in Bulgaria – ‘capitalism is infallible!’, ‘total privatization!’ – if something goes wrong, it is because of a few unfair players such as TIM. According to those liberals, if there is free competition, the market would regulate things properly and there would be no gangsters, marring the architectural appearance of old buildings due to their poor tastes. 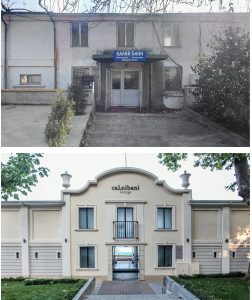 The Baths’ facade before and after the latest renovation works. But the market does not need affordable mud therapy facility and public hospitals. It needs venues with an expensive entrance fee. And here we stumble upon a social problem, not an aesthetic one. It is sad that the Sea Baths lost their architectural charm, but it is far worse that they lost their function as an accessible and publicly beneficial space. TIM is only a small detail in this problem, because we can witness the same kind of loss in other places, outside TIM’s sphere of influence. We mentioned Plovdiv, but something similar happened with the old city library in the capital Sofia, for example. The problem is not in the currently ruling political party, either, because the continuous privatization of the Sea Baths took place during the rule of different governments without meeting resistance. Maybe it is about time that we question the idea of privatization of public space and challenge the reasoning that presents it as ‘inspirational’, characteristic of mainstream liberal discourse. And we need to ask ourselves if the change is indeed ‘good for everyone’. Панайотов, Иван. 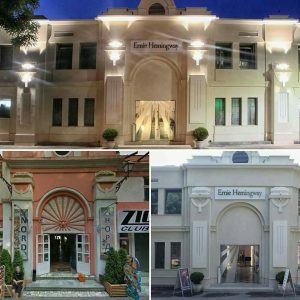 Tourist Guide to Varna / Иван Панайотов. – София: Медицина и физкултура, 1970. 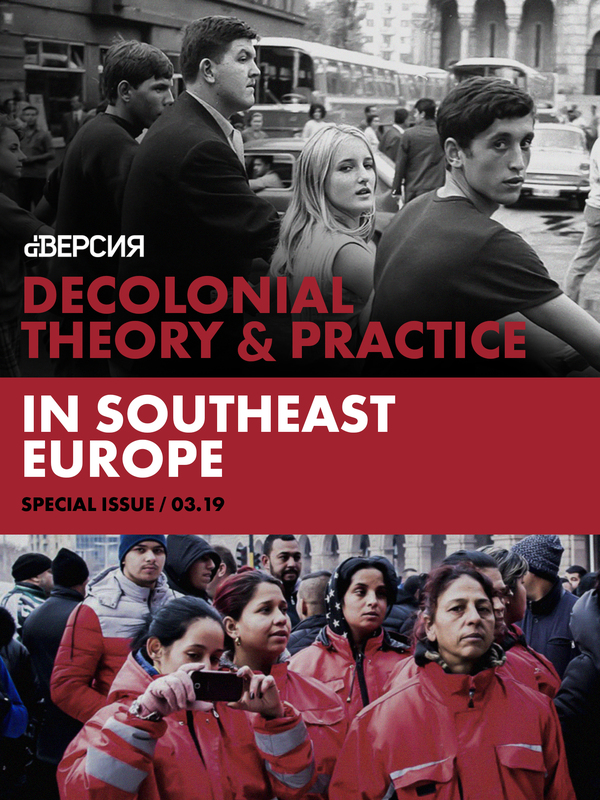 Petar Dobrev is a journalist and a doctoral candidate at the department of History at the University of Sofia. He is researching different aspects of the Balkan’s social history as well as the history of the agrarian question.